KJM Electrical Ltd provide comprehensive support solutions for utility providers. We take full ownership of replacement or roll-out programmes, from initial customer contact through to completion. Our dedicated procedures maximise efficiancy and prioritise end-customer satisfaction. This reflects favourably on our clients. Carding/ mailing homes and premises. Appointment setting with automated phone/ online customer systems and direct engineer follow-up. Meter/ End Box collection, installation and disposal. Professional systems, liveried vehicles, accredited and uniformed engineers. Our teams provide a full range of metering services including LV cable jointing. We have a reputation for exceptional standards of delivery and reporting. 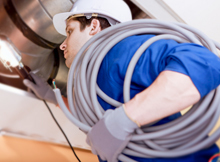 KJM provide a full preventative and reactive maintenance service. We offer scheduled and rapid-response strategies to multi-site public, commercial and industrial clients to ensure legislative and insurance compliance. All service teams are security cleared and KJM clients value our emphasis on sustained working relationships and minimum disruption. Mains distribution, lighting and power. Lighting, power and distribution within commercial, corporate and manufacturing environments. Large-scale installation, energy consultancy with a cost-reduction focus and turn key projects. Specialist environments such as caravan parks, marinas and fuel depot locations.